Still have a few questions about the festival? Well then have a read through the FAQs below! For our main Summer Festival page click here. The date of the Summer Festival will be from 16th to 19th August 2018. Where will the festival take place and how do I get there? 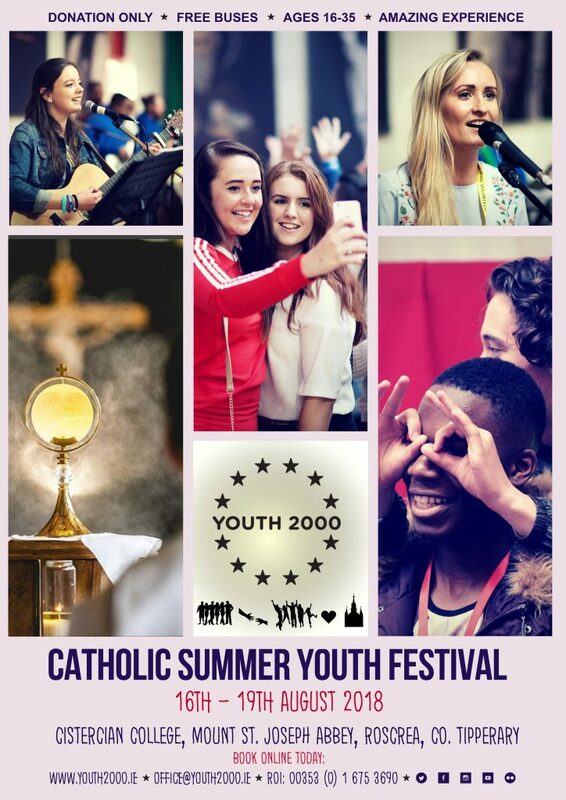 What happens at the Youth 2000 Summer Festival? The Youth 2000 Summer Festival is full of variety. The festival includes inspiring talks, music, prayer, concert, workshops, dramas, share groups, reconciliation and healing service and Mass. It is a packed program but there is also time for chatting, sitting, relaxing, soccer and generally chilling out. What is the theme for this year’s festival? The theme for the festival is …. This is a youth event, so we strictly limit the age profile to those between 16 – 35 years who wish to attend. If you are over 35, this festival isn’t really for you although we do always need mature volunteers to help with the running the festival. If you’re interested in coming along to help in some way, please contact the National Office on 01 6753690 to discuss this matter further. Any prospective volunteers need to be Garda vetted and referenced checked. I am under 18, how do I book? If you are under 18, please register online on the main Summer Festival page. Follow the simple procedure and at the end of this process you will be shown a parental consent form, please print this off, get it signed by your parent/guardian and present it to the Under 18 registration desk when you arrive at the event. This strictly applies for 16 & 17 year olds only. If you are under 16, unfortunately you cannot attend this event. Please bring ID and proof of age cards with you. You must have valid ID and parental consent form in order to gain entry. You will need to bring a sleeping bag, pillow and maybe some ear plugs with you! Just bring the usual stuff you would normally bring if you were heading away for a weekend – towels, toothbrush etc. Showers will be provided on site. Dress warmly too as the evenings can get a little chilly! We are providing basic accommodation for all retreatants. All accommodation is inside the College, real beds in dormitories and airbeds in other rooms. There will be separate accommodation for guys and girls; it will also be communal so bring a sleeping bag and a pillow! We will do our best to provide for special dietary needs. Bring additional special foods with you too if you have a special requirement. All meals will be scheduled into the timetable, so you’ll have to get up on time for your breakfast! I have special dietary needs, can these be catered for? We will be able to provide a vegetarian option and will be able to provide separate meals for coeliacs. Please bring some of your own specialised food with you too! Is this just something for Catholics? It’s not JUST for Catholics, but it is a Catholic youth event. All youth are welcome, whatever your faith background. How do I get to Roscrea? Where do I go when I arrive at Roscrea? Registration! At the registration area you will get your festival pack for the weekend and find out where you will be sleeping. What kind of facilities will be available at the Festival? There will be shower and toilet facilities of course, and all meals will be provided. The Summer Festival runs from Thursday afternoon to Sunday afternoon. The Festival starts with registration on Thursday and the programme runs until about 10.30pm. The retreat programme starts early on both Friday and Saturday morning and runs until late. The programme starts early on Sunday morning and ends on Sunday afternoon at about 3pm. Full details of the programme will be available in due course. I can only come for part of it, is this okay? Yes, you are welcome to join us at any stage over the weekend. It is very important that you book online anyway, regardless of how long you plan to stay for, so that we know you are coming. I do not know anyone, is this okay? Yes, please come along! The vast majority of newcomers do not know anyone and they have a great time. We are a friendly bunch and you will be made most welcome! This festival is donation only, so it won’t break the bank. You can give as much or as little as you can afford, all done anonymously. The festival costs Youth 2000 €85 per person to run for the weekend. If you genuinely cannot afford to donate much, please do come along anyway and do not let money be an obstacle. Donate what you honestly can afford. To donate online, please click here! Can I see what previous Youth 2000 festivals have been like? Yes! Have a look at the highlights of a previous Youth 2000 Summer Festival below!